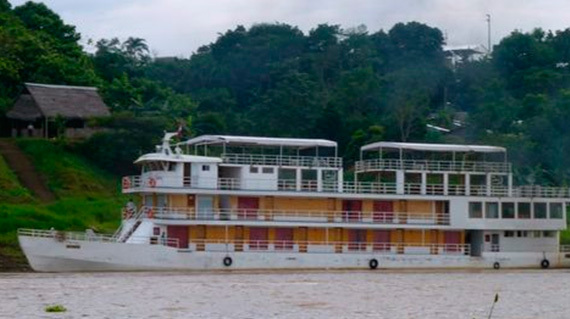 The 32-passenger Queen Violet boat offers travelers the ability to explore the Amazon in freedom and comfort. 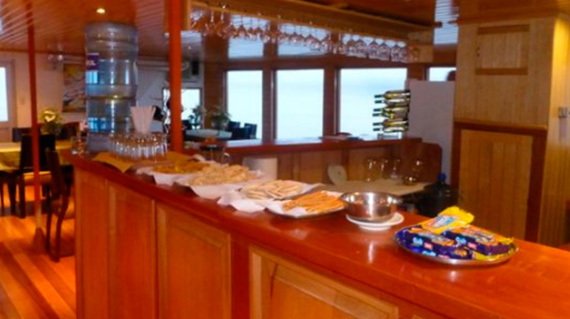 Roomy social areas, great sightlines, river-facing cabins and a pair of skiffs for shore excursions you won´t miss a thing. 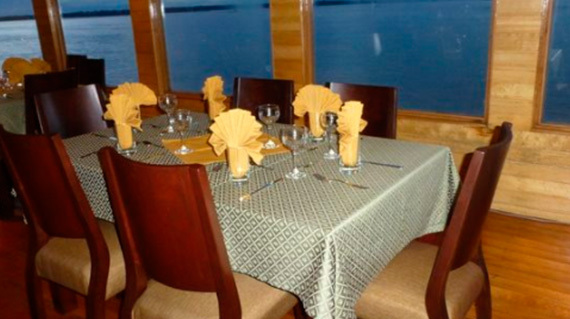 All about the Queen Violet Amazon River Cruise. The Amazon Basin is home to some of the most isolated communities in the world. Head ashore and discover how civilizations survive and thrive here through shamanic ceremonies and visits to local markets. Connect with locals and explore the other side of life. What´s a typical day like? Most excursions take place in the morning and late afternoon when wildlife is most active. During hotter midday hours, your naturalist will host informative presentations on humand, plant and animal life in the Amazon. The Queen Violets best-in-field crew is handpicked for their knowledge of the Amazon River, its people and wildlife. Formal lectures and informal chats open up the conversation about the diverse and fragile ecosystem that surrounds you. Meals offer a healthy mix of international cuisine and Peruvian fare prepared from fresh local ingredients, providing a unique – and delicious – window into local culture. The Queen Violet´s dining room seats all passengers at once at table for four to six. What´s it like on board? Designed for life on the Amazon, the Queen Violet offers a comfortable floating-home-away-from-home with great sightlines, spacious dining facilities, a roomy observation deck and river views in each cabin. Nights aboard the Queen Violeta Amazon riverboat. Arrival transfer in Iquitos & Nauta. Launches and land excursions with our expert naturalist team. Tips extra on board the Queen Violeta. 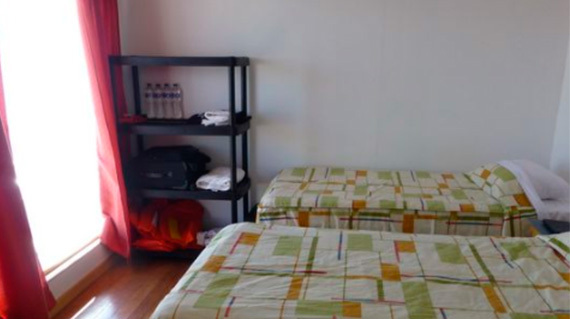 Upon arrival from your international flight, you will be transferred to your hotel and overnight in Lima, the national´s capital and largest city. Today you will begin very early, to have time to eat breakfast and catch your flight to Iquitos, where you´ll be transferred to the Amazon River ship, your home for the next seven days. But before boarding, we get acquainted with this jungle port city an orientation tour. This is the country´s main river port, established in 1864 in the heart of rubber country on the Amazon´s deep waters. Like any port, it has a hustle-bustle feel, yet it is not without its places of quiet and shaded retreats. Much of the architecture we see is a 19th-century vestige of the era when European commercial barons held sway over life and culture here. And while Iquitos has seen many fortunes rise and fall, its isolation has remaind constant: access to the city is only by air or river. You will also make a brief stop at the Amazon Manatee Rescue Center. The Amazonian Manatee is very rare and endangered mammal unique to the Amazon Jungle. This center focuses on rescuing orphaned manatees who have been victims of poaching. The centre helps rehabilitate and reintroduce these wonderful creatures back into the Amazon Basin. Here you will see all the efforts of rescue center as well as have the opportunity to feed these amazing and loveable animals. Once onboard ship, you can just relax and let the wild life surround you. Step out on the deck to watch the riverbanks go by – but keep your eyes peeled for wildlife such as gray and pink dolphins. Our ship casts off and wends its way to the confluence of the Marañon and Ucayali Rivers. Here, it is generally (but not universally!) considered that the Amazon River begins, at least in name. After breakfast, you have an excursion on the Amazon and some of its tributaries to see the wonders of the rainforest. This is your chance to see monkeys, sloths, and a variety of birds. 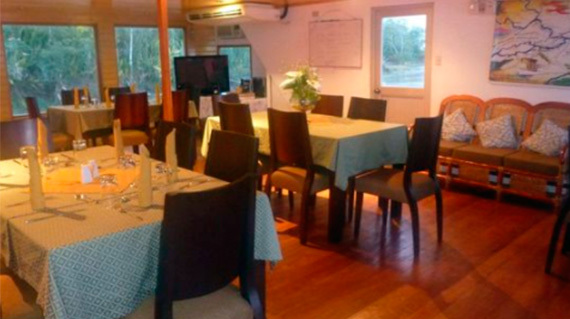 Back onboard, we´ll gather for lunch, followed by a presentation on the Amazon River. Afterwards, you´ll walk along the shores of the Ucayali River, located in the Yucuruchi region of the Amazon. Here you´ll have an opportunity to see the Victoria Regia water lily – a gigantic authentic plant. Today you rise early to visit Pacaya Samiria Reserve for a full day of discovery in Peru´s largest national park. Then, keep your eyes wide open and your binoculars ready to catch the sight of cocoi heron and striated herons, colorful macaws, squirrel and woolly monkeys, caiman, sloths and many more primate bird and mammal species. Current counts record more than 200 bird species and 10 primate species within its boundaries. Our route takes us over the tributary waters of the Marañon. Along the way, our guides will point out the interesting wildlife species that in habit the riverbanks – not to mention the unusual fish and vegetation in the river. 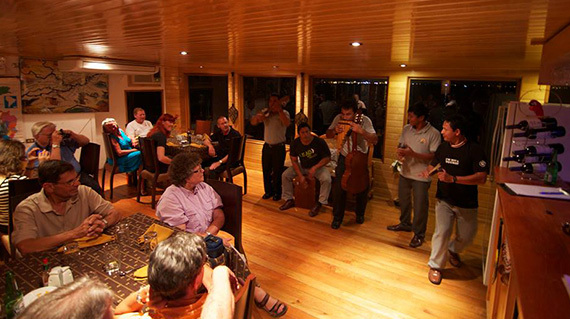 Back onboard, you´ll gather for breakfast followed by a presentation on the life, history and culture of Amazon´s main tribes. After lunch you have an introductory discussion about shamanism that will help you understand the traditions of the rainforest people. The ship then arrives in the Amazon Natural Park where you´ll take a short walk to the Enchanted Lake. Here a catamaran waits to sail you along the lake´s tranquil waters, where you´ll listen to the local birdsongs and keep your eyes peeled for sighting the different animal species found in this area. Before dinner you´ll touch upon the spirit realm, paying a visit to a local shaman. Mystic, minister, healer – one might consider a shaman to be ¨all of the above¨. But to understand shamanism requires something of a leap of faith, a leap into the spirit world that is the shamans domain. Shamanism is practiced around the globe, and is universally distinguished by a trance state called shamanic ecstasy. In these ¨out of body¨ travels, the shaman enlists denizens of the spirit world to help him with a variety of duties, from healing the sick to assisting a deceased persons soul into the after world – and all the while, the shaman remains conscious. Before you leave the Amazon Jungle, you´ll gain rare insight into the complexities of this phenomenon when you meet an actual practicing shaman in a river village. He´ll introduce you to his spiritual healing craft and tells you about rainforest plants that indigenous peoples have for untold centuries held to possess curative properties. Your experience may not be ¨out of body¨, but its sure to be out of ordinary. The early morning offers a opportunity to watch the world awakening in the rainforest. Perhaps you´ll spy iguanas, river turtles, cormorants or wattled jacana during this excursion. You return to the riverboat and prepare to meet a local Indian family. They will welcome you in their home to share conversation over the midday meal, introducing you to their culture, costumes and way of life. This is a rare and unforgettable opportunity to gain new insight into a world truly apart from your own. Be sure to be well rested, so that you won´t miss our late-night excursionto discover who comes out at night in the jungle! As we join our trip leader for a nighttime boat ride in the wild, be on the lookout for mammals, bats and reptiles such as capybara, black caiman, poison frogs, and a vast number of other species. Today you rise early and set out to explore the impressive biodiversity of this unusual ecosystem. You´ll look for a quiet spot to enjoy your picknick breakfast, followed by a trip to explore Choroyacu. You´ll also ride up the Nahuapa River for a little fishing expedition. What´s biting? Piranhas of course! Reputedly ¨the most ferocious fish in the world¨ (to quote Teddy Roosevelt), piranha are a dietary staple for many of the Amazon rainforest´s indigenous people. While fearsome, they´re also esteemed as some of the best eating fish in South America. They have a light, nutty-tasting flesh that lends itself wonderfully to any number of cooking methods, which you´ll discover when you cast the lines today. Piranha aren´t terribly selective about what they eat, making Piranha fishing fairly easy. No hand-tied flies or special casting techniques required. It´s often enough just to drop a line – usually baited with raw meat or chicken – where they´re swimming. We will also visit Choroyacu Creek where we´ll have the opportunity to climb in a dugout canoe and explore this scenic area with the locals. After lunch, you´re invited to plunge into the river for a swim, perhaps sharing the water with the pink or grey river dolphins. Back onboard, we´ll enjoy a video about the flooded forest. Then we can kick up our heels as we learn a local dance. You´ll have another chance to witness the nocturnal life of the rainforest after dinner this evening, as you venture out in small boats onto the Marañon River. Perhaps your flashilight will reflected the red eye shine of a black caiman – or even the glowing yellow eyes of a jaguar! It´s back to civilization today, as the ship returns to its home port of Iquitos. But before we dock, we have a few more unique experiences to look forward to. This morning we´ll call on the town of Nauta, where the Ucayali and the Marañon – the major headstreams of the Amazon – join together. On the included tour, you´ll ride the local motorcars and browse the local market. You´re welcome to try your hand at bargaining! Continuing on the way, you visit the Sapisapi River to look for charapas and turtles. The river has given up its secrets – or at least some of them. Tonight, we´ll celebrate our discoveries at our Farewell Dinner and Party, complete with live music, aboard our ship. Disembark at Iquitos. We will transfer to the Iquitos airport for our flight back to Lima. Once arriving in Lima you will be met by a representative and transported to your hotel. Spend a final night in the city of kings and enjoy a pisco sour or try some Peruvian ceviche!